In international relations, the change in regime in a country brings hope and aspiration as well as opportunities for others. In that sense, regime change in India and Sri Lanka has exposed set of opportunities for each-other’s to renew and reshape their bilateral ties which have been gone through many ups and down in last three decades. Making his intention clear, Maithlipara Sirisena chose India as his first foreign tour. On his four days visit to India from February 15 to 18, Sirisena set a fresh ground for renewed bilateral ties. His maiden visit to Indian leaves none in doubt that Sri Lanka wants enhanced economic, political and diplomatic support from India to execute its major policy reforms. Sirisena though claimed to reshape the Sri Lankan foreign policy but his balanced foreign policy view, which does not reject China’s role after it gained the position of largest investor in Sri Lanka, caution India. In that sense it becomes much important for India to capitalize on the opportunities cropped up in Sri Lanka recently. Smelling Sirisena’s right intention and willingness to engage, Indian Prime Minister Modi gave reciprocal visit to Sri Lanka in March and assured his commitment of constructive engagement for the development of Sri Lanka. At the same time Modi also reminded new government the slow progress on ethnic reconciliation and reiterated the importance of reconciliation, for Sri Lankan society, and for that implementation of necessary constitutional provision is mandatory. Relationship with Sri Lanka is fraught with complexities. In this context, Modi acknowledged the growing presence and influence of China in the infrastructure development as well as political arena in Sri Lanka. Therefore, Modi’s visit to Sri Lanka carried high value and becomes important point to analyze the impact on relationship in the years to come. Modi’s visit, as experts says, would also write new chapter in the bilateral relations. So, in this context, I would attempt to explore the significance of his visit and the factors which would lead to the new chapters in the bilateral relations. India and Sri-Lanka relationship is shaped by host of irritants which ranges from fisherman’s issue to maritime security. The relationship between the two has not been able to reach to its potential in a sense that for India, Sri-Lanka is the key player in Indian Ocean and important for India’s maritime security along with national. On the other hand, India is the biggest trading partner and closest neighbor for Sri-Lanka. Despite such indispensability for each other the relationship between the countries could not take off. In this context, PM visit becomes much more significant. It all began with when Modi extended formal invitation to the heads of a state of neighboring countries including Pakistan and Sri-Lanka. The main intention behind this move was to begin the process of geo-political realignment in the region aimed at containing china’s influence in South Asia. However, the real change began noticeable when Maithlipala Srisena, chose India as its first foreign tour as a head of state. This visit demonstrated Srisena willingness to reshape Sri-lankan foreing policy. In this view, the recent political transition in Sri-Lanka is not only important rather it has generated hope in India about the prospects of important relations. Matching the tunes of Maithalipapa Srisena, Modi visited Sri-Lanka. Thus, it is beyond the doubt that high levels of engagement after years of isolation recast and redefine the contours relationship. The visit would favour Indian image and Modi’s policy on neighbourhood. This visit may dispel the long held view that India snubs its neighbours . India and Sri Lanka signed four MoUs during this visit. These include youth exchanges and education, construction of a university auditorium, visa exemptions for official passport holders and customs cooperation. Apart from these MoUs, the Prime Minister announced a US$ 318 million Line of Credit (LoC) to upgrade the Sri Lankan railways; promised to build Trincomalee as a petroleum hub and complete 500 MW Sampur power project as well as initiate e-visa services for Sri Lankans. India has committed 1.6 billion U.S. dollars in development assistance in the past. The issues covered during the visit reflected Indian and Sri Lankan governments’ willingness to engage at multiple levels. For instance two agreements and two MoUs were signed during Sri Lankan President’s visit to India in February. These included cultural and agricultural cooperation for the year 2015-18, expansion of defence and strategic cooperation and the Civil Nuclear Co-operation Agreement which was signed for the first time between the two countries. Cultural diplomacy is the constituent element of Indian foreign policy. And it becomes more significant with a country which shared long historical relationship with India. Modi’s choice of places to visit is politically and culturally significant. For instance, he visited Anuradhapur, which is cultural capital of Sri-Lanka. The place is quite significant in Sri-Lank. It is ancient capital of India and also the place where son of the king Ashoka, Mahinda landed and permeated Buddhism in 3rd BCE. It is interesting to mention that cultural relation between the countries continued without any difficulty despite of stagnation or little progress in other sectors of engagement. This is to the fact that there is strong cultural connection between the two countries, which did not allow them to live in isolation. In fact, India has made use of cultural diplomacy in past. For instance, the decision to land the Kapilvastu relics to be displayed in Sri-Lanka for the second time in 2011 was welcomed by the devotees. And this decision was taken in-spite of the earlier directives not to allow the display of sacred relics outside India due to its inestimable value and delicate nature and huge logistics and planning required for their exhibition. Another extension of the cultural diplomacy can be seen that Sri-Lanka is involved in establishing the international Buddhist University in Sanchi and is part of the Buddhist circuit that India is developing in the subcontinent. Both countries have agreed to commemorate 2600th year of Buddha attaining enlightenment. And PM’s reiteration of this will percolate well with majority Sinhalese audiences. There are many political challenges between Indian and Sri-Lanka. Both the countries have agreed to address these pending issues. Modi in his visit acknowledges the contentious issue of fishing rights that has led to tensions between two countries and stated that it is a livelihood issue and have humanitarian dimension. Thus, it must be handled as a humanitarian concern. He urged fishermen from both side to find mutually agreeable arrangement and forward it to the government. Addressing the trade issues and emphasizing on the shared commitment of stronger economic cooperation, both the sides agreed to renewed cooperation between customs authorities to trade and reduce non-tariff barriers on both side. Adding another pillar to the relationship, New Delhi signed currency swap agreement of USD $1.5 billion to help keep the Sri-Lankan rupee stable. Due to domestic political compulsion, India continues to support Tamil cause in Sri-Lanka. Modi stressed to go beyond 13th Amendment in terms of political empowerment of Tamil minority and work positively for reconciliation. Since the amendment provides for the enhancement of the power of the provincial councils in the North and East including powers over police force and land use. It is also important to mention that Sirisena, has made his initial moves towards fairer treatment of minority Tamils and Muslims of Sri Lanka’s North and East and it can be sustained if India incentivises and persuaded him to keep liberalising Sri Lanka’s top-down and state-dominated social order which is hindering the social cohesion in Sri Lanka. Also, New Delhi can strengthen Sirisena’s hand against the militaristic Sinhalese elites by associating Indian diplomacy with tolerant groups. This at the end reduces the so created divide between Sinhalese and Tamils. India’s constructive engagement in developing infrastructure in Sri-Lanka is major part of its foreign policy. India is involved in many development projects which range from development of railway infrastructure, Kankesanthurai Harbour, Palay airport, Duraippah stadium in Jaffna to building Sampur coal project in East province. Engagement of this nature would help to win confidence of not only government but Sri-Lankan people too. India is building houses in the war torn region of Jaffna. This has supplemented government efforts of reconciliation of Tamil’s. Railway is a major form of transportation in Sri-Lanka and most of the railway infrastructures were destroyed by LTTE during 1982-2009. As result of this, it has alienated people from the war torn region and has made the integration process rather slow. Acknowledging the importance of infrastructure development and current state of infrastructure, India has given loan to revamp the railway network. It is undoubtedly said that the inauguration of railway line promotes development, reconciliation and greater integration by bringing people in different parts of the Island closer. In this context, India’s effort of revamping Talaimannar train service which was destroyed during three decades of civil war can be seen as investment into the future. However, the internal politics of Sri-Lanka delayed some other development engagements with India. The previous government led by Rajapaksa developed pro-China policy at the cost of delaying engagement with India. Therefore, there was little progress made on some development initiatives like Sampur Power project. But the change of regime in Sri-Lanka has renewed Indian hopes of ushering into new epoch of bilateral ties. That can be rightly observed On Modi’s visit, where he emphasized government to move on the 500 MW Sampur Power Project that has been delayed for years due to environmental concerns. Walking on the same line, India has finalized the long delayed CEPA, which was proposed in 2003, to promote economic integration. Strategically, this would also help India to counter waxing Chinese influence. China has though funded larger project worth nearly $5 billion and engaged in developing airports and coal power projects. That has caused concerns for the government. Chinese aspiration to setup foothold in Sri-Lanka is great concern from Indian foreign policy in Sri-Lanka. In this context, Chinese huge investment in infrastructure development can be rightly observed. India, however, could do little to contain growing Chinese influence in Sri-Lanka, because it can hardly influence Sri-Lanka’s bi-lateral relations with other countries as well as the unsupportive political setup. As a consequence it did make little progress in the relationship. Though, India has adopted counter measures to check the Chinese growth in Sri-Lanka and in this context, Modi’s visit, an act of reciprocation of president Srisena visit to India, after 28 years long gap displays his intention and determination to give new direction to the bilateral ties. However, there was period of stagnation in the relationship during the previous Sri-Lankan government when India has to compete with Chinese investment. The recent political transition has given fresh opportunity to reshape the bilateral relations. Therefore, it becomes important to mention the ways of engagement followed by India and china in Sri-Lanka. On close analysis, it could be observed that there is a significant difference in their style of engagement and investment in Sri-Lanka. For instance, China has huge capability and surplus capital to invest in a country and bring that into its zone of influence. The size of investments China does in Sri Lanka is huge in capacity and high in worth. For instance, China has funded projects of worth $1.4 billion to build a city equivalent to the size of Monaco in Colombo near port. Also, China has planned to invest $40 billion to fund infrastructure in Sri Lanka. On the contrary, India has small projects that are based on partnership model of development. And so, India’s has followed partnership based investment and development programs. India works on the model of partnership instead of dumping funds in the project. In short-run, Sri-Lanka may observe the unbridled flow of fund and foreign investment to develop its harbor, port and railway but in the long it needs to build its capacity to consume and self-reliant, which could only possible if it follows the partnership based model, which the current government has realized and recognized. Beyond this engagement and investments, Indian projects are attracted lot of flak for its untimely completion of the project. So,there is a general perception prevails that Indian projects fails to meet deadline whereas Chinese completes it on time. Among all the projects, infrastructure projects that are often in the news for delays and mismanagement. For instance two projects of GoI, Infrastructure projects (road construction projects), Jaffna cultural centre and setting up of hospital at Dicoya, can be seen in this regard which has crossed its due date but not completed. Setting up of hospital at Dicoya was initiated in 2011 and expected to be finish in 2012, but it could not finish GoI has to shift the year of completion to 2014. Jaffna culture centre was initiated in 2012 and expected to be finish in 2015 but the date has been shifted to 2017. With respect to the delay in projects, it is pertinent to mention that India’s problems of delay in execution are unique because of the kind of grants or aid it gives to Sri Lanka, which is largely in the capacity-building area (which have direct impact on public) and for strengthening institutions of representative governments. 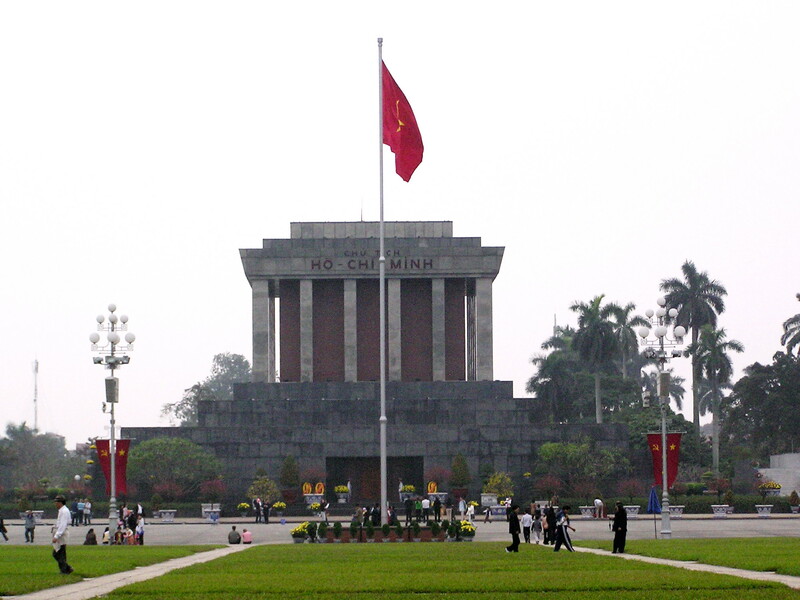 This is, however, quite different from China, which has the ability to swiftly complete projects on an ambitious scale. It is also true that the reasons for delay are sometimes statutory in nature for instance getting clearances from the government, unfavorable local conditions, harsh labour laws. Even the two Indian projects are in the grip of statutory clearances and caused to delay. But that too can’t be sufficient reason for delay in other infrastructure projects. However China faces problems unlike India too. For instance, it is often accused by its aid recipient’s countries of undertaking projects that are resource-exploitative, and of bypassing local norms and regulations. The nature of aid or grant given by China or to say western countries are conditional and that come at the cost of undue political interferences in the recipient country. Unlike them, Indian aid giving is far more favorable and acceptable in the recipient country like Sri Lanka. And this is a fact government on which GoI need to capitalize and expand its programs with due completion. And therefore, GoI must focus on reducing the delivery deficit and finish the projects in timely manner because the unnecessary delay will continue to hinder India’s infrastructure diplomacy and prospects of deeper engagement in the long run. India’s engagement can’t be limited within the brackets of infrastructure development only. In fact, unlike China, India is a much needed partner to build ‘ethnically’ divided Sri-Lanka into politically and ethnically united Sri-Lanka. In this context India’s commitment to build housing projects in the war torn region of Jaffna can be seen. Adding to its development effort and its intention, Modi historic visti to Jaffna can’t be ignored rather it has cemented the bilateral ties. Modi is not only the first Indian Prime Minister who has visited Jaffna rather only international leader after David Cameron(2013), who visited the region. It has great symbolic importance. Jaffna plays crucial role in Tamil politics in both the countries. It was a stronghold of Tamil Tigers who defeated six years ago. It is worst hit regions which witnessed decade long civil war. It is worth mentioning that Jaffna is not only separated from the rest of Sri Lanka geographically, but also culturally. The Sinhalese majority is predominantly Buddhist whereas the Tamil minority is largely Hindu in Jaffna. It is that ethno-political divide that dragged the region into bloodiest civil war. 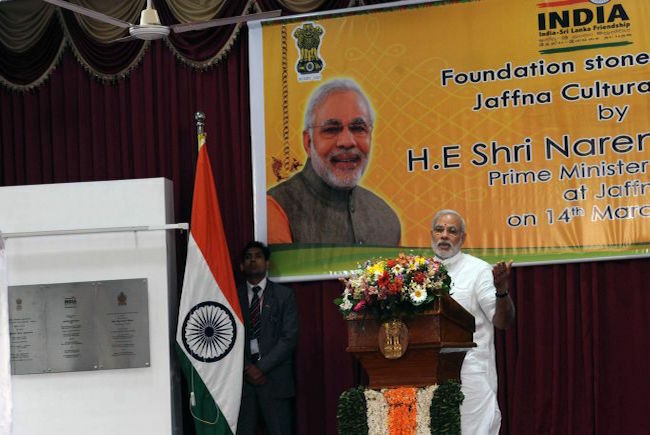 Why Modi visit to Jaffna becomes important and required close analysis? The answer lies in the fact that Jaffna has always been the heart and cultural center of Hindu-Tamil Sri Lanka. It’s Jaffna that played a crucial role in the lead-up to the separatist conflict. And it’s Jaffna that stands to play a vital role once again in the rebirth of northern Sri Lanka. Since, the LTTE have made to disappear by the previous government in bloodiest war which caused high never of civilian’s death too. So, India needs to convey the message that Tamils needs to first concentrate on fixing the immediate grievances related to post –war displacement rather than exerting pressure on Colombo. Strong and vibrant institutions are the pillars of democracy. Sri-lanka governments need to recollect and restore the faith of alienated Tamils in the government institutions by speeding up the reconciliation process. India is also making efforts to ethnic reconciliation and in this context, Modi’s act of handing over 27,000 new houses to mostly for Tamils who became homeless during the war. Though, his brief visit was symbolic but he conveyed the strong message to Sinhalese government to fully implement the 1987 constitutional provision on greater autonomy and he did not miss to highlight that India has successfully maintained the co-operative federalism despite of huge diversity and thus, Sri-Lanka may also progress on the same lines and ensure better political autonomy with united Sri-Lanka. The visit of Sirisena after becoming the president and then Modi’s reciprocated visit to Sri-Lanka has undoubtedly written new chapter in the bilateral relation, which has been rollercoaster ride since last three decades. Both the leaders have expressed their strong desire to reshape the relationship. But the road is not devoid of complexities and problems. Reconciliation of Tamils and implementation of 1987 constitutional provisions fully are key the areas where Srisena has to perform faster. Modi, on the lines of his predecessor has reemphasized the pending issues and bring to the fore that a politically stable and united Sri-Lanka is good for the peace of the region. 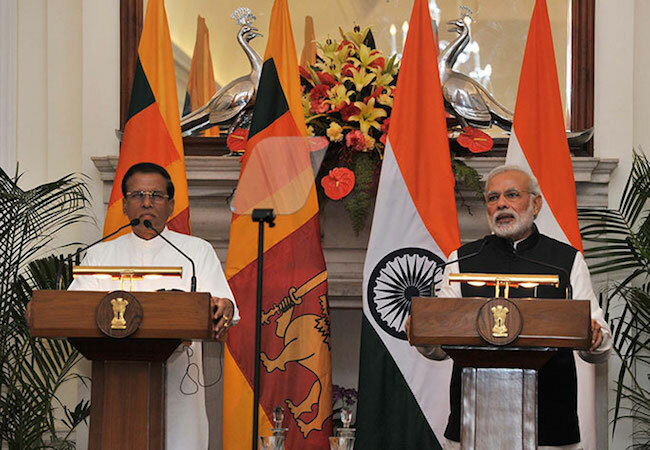 Modi gave assurances that India would fully cooperate in the political cohesion and development of Sri-Lanka and thus, emphasized more economic engagement that should based on partnership. India can’t afford to disengagement with Sri-Lanka,key Indian ocean player, in the dynamic regional setting. Thus, in this context Modi visit and new chapters of economic engagement is an investment in the bilateral relationship, which would give the result in the years to come.